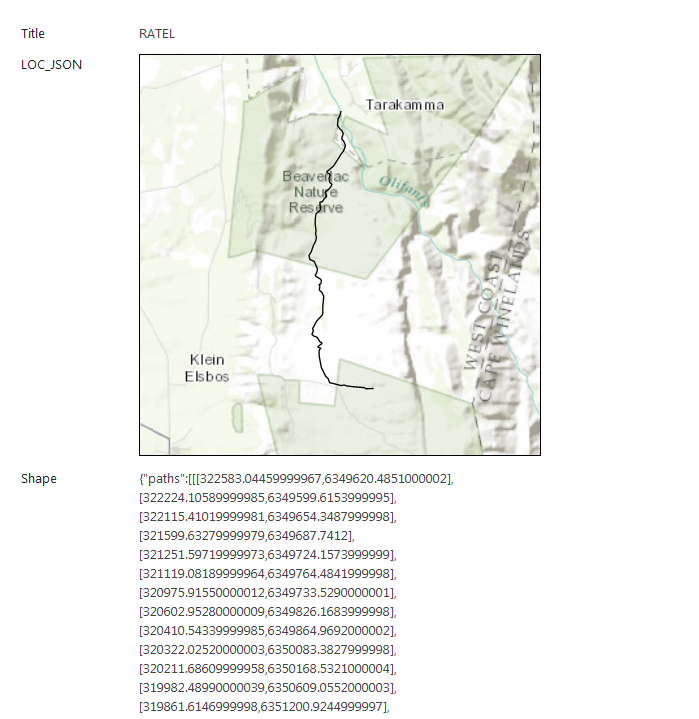 A while ago I was asked to find out how to display line geometry on a map using SharePoint lists. After some creative googling, I came across an ESRI thread, and another one, which pointed me in the right direction. This example uses a single line feature to demonstrate the methodology I developed. Of course you can save the file immediately as a JSON file, but I am so used to writing it out to CSV that I automatically put that there. Create a custom list (or open your existing one). Add a plain text column called Shape of type Multiple Lines (not sure if this is a requirement, but I figured it couldn’t hurt). As mentioned in the thread, the column must be created with the correct title – renaming an existing column will not work. Add a ESRI Maps Location column to the list. Under Location Settings > Coordinate Fields, select Shape. The field dropdown should automatically populate the Shapecolumn we added earlier. Create a new record in your list, and populate your attributes. Copy the JSON string from the file created earlier and paste it into the Shape column. This is a nice way of storing commonly accessed features such as study area boundaries, in a central list without a dependency on map services hosted on ArcGIS Server or ArcGIS Online.